The Conservatives will not disclose the identity of wealthy supporters who lent the party large sums of money, the party's treasurer has insisted. Jonathan Marland spoke out after Labour published a list of backers who secretly lent the party almost £14m. 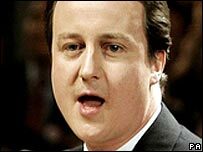 "I am not prepared under any circumstances to disclose where the loans come from," he told BBC2's Newsnight programme. David Cameron says there should be a ban on loans to political parties. He also outlined plans for a £50,000 limit on donations and for new state funding of political parties in the wake of Labour's loans controversy. Deputy Prime Minister John Prescott has demanded the Tories follow Labour in revealing details of past lenders. But Mr Cameron says he will not be "bounced" into revealing the names, adding that it was "very difficult to retrospectively name" past lenders. Mr Marland says he also sees no reason to follow Labour's example and publish the names of individual lenders. "Labour are in a very big hole, of course. We are not in the same hole," he told Newsnight. "They are embroiled in a serious mess relating to promises they have given to people who have lent them money. "We are not in this mess because we are not in power. We don't have patronage to give and we are not in the same position." He said all loans to the Conservatives complied with the Political Parties, Elections and Referendums Act. But he refused to say whether any of the loans came from other countries. Foreign donations are not allowed under the Act, although it does not include loans. Mr Cameron has argued that in future political parties should only be able to borrow from "financial institutions on fully commercial terms" and not individuals. But Mr Marland said he believed the practice of accepting loans from individuals was very useful. "It is a very, very good mechanism for us to help our cash flow." Mr Cameron said under his plans, the numbers of MPs would be cut from 646 to less than 600 to help pay towards the cost of slashing donations to political parties. The costs of government special advisers and regional government would also be cut to pay for the changes. Parties with MPs would get £1.20 from the taxpayer for every vote they won at the last general election - plus an annual payment of 60p per vote won. That would mean Labour and the Tories getting more than £30m and the Lib Dems about £20m over a four-year term. Mr Cameron said he also wanted the limit on each party's spending at elections to be cut from £20m to £15m. "We've got to stop this perception that parties can somehow be bought by big donations either from very rich people, or trade unions, or businesses," Mr Cameron told BBC News. There would be tax relief on donations of up to £3,000 under the plans. The Tories have also received large donations and loans but party officials say they do not know whether any of the Conservative nominees for peerages have lent money to the party. Mr Cameron says he has not yet nominated anybody for a peerage and wants to focus on proposals for the future rather than defending the past. He also suggested there should be a new commission, separate from the prime minister, for the honours system and appointments to the House of Lords. Tony Blair has said he will leave decisions on knighthoods and other honours to the Cabinet secretary but continue to appoint Labour working peers. The current House of Lords Appointments Commission vets party nominees for peerages but can only raise concerns - Mr Blair has the final say.